Taking an infant's temperature isn't always easy, but it's important you get an accurate reading. Baby thermometers can help make it simpler to take your baby's temperature. You can choose between rectal, temple or ear thermometers depending on the accuracy you desire and what is easiest for you to use with your baby. Here at Walgreens.com, brands Mabis Healthcare, LifeSource and Vicks give you options for choosing a baby or kid's thermometer. From newborns to toddlers, rectal thermometers can give a dependable and accurate reading. 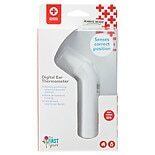 If you're looking for a faster reading, you can choose other digital thermometers that can take as little as one second. Most baby thermometers beep or alert you in some way when your child has a fever. Temple thermometers can be easy to use, and there is even a pacifier thermometerthat can be pleasing to your baby. 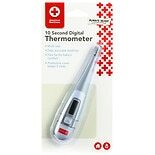 There are a range of thermometers to choose from for the entire family. You can make your choice depending on how fast you'd like a reading or how precise and accurate you need it to be. 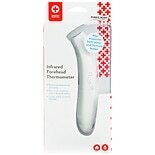 Infrared thermometers and forehead thermometers offer a non-invasive way to take a reading. You can even find basal thermometers here that come with tools for tracking your daily temperature as part of family planning.